Warren G. Harding won the Presidential election of 1920.A group of influential men who assisted President Harding and were from his home state were called the “Ohio Gang.” Many asserted they mislead Harding to pursue corruption. For instance, in Teapot Dome, Wyoming, oil rich lands were set aside for the government. Yet, Albert Fall, the Secretary of Interior, accepted a bribe of $400,000.00 to lease the land to private oil companies. 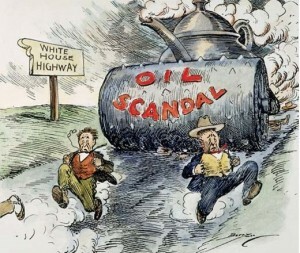 This was called the Teapot Dome Scandal and many asserted it proved that Harding was incompetent to stop corruption from occurring in the government. Warren G. Harding served from 1921-1923 and died of a heart attack in office. Calvin Coolidge was the Vice President to Harding and served from 1923-1929. The Republican economic policy of the 1920s can be described as a trickledown economics system with low taxes on the rich and little regulation for the stock market. This meant the government avoided interfering with businesses as much as possible. The American economy saw a surge in economic activity in this decade and businesses gained immense wealth. Yet, the Great Depression soon followed. A massive issue of controversy in the 1920s dealt with the issue of evolution. A scientist named Charles Darwin sought to explain why there is such diversity among living things in the 1800s. In the 1800s, many religious theists, especially fundamentalists, attributed this diversity to the notion that God created all living things individually. Darwin disagreed with this claim. He taught that evolution was the process that naturally created the diverse species on the planet. In 1859, Darwin published On the Origin of Species to elaborate on his theory of evolution. According to Darwin, living beings compete for resources, such as food, the fittest survive and then they pass their traits to their decedents. The weaker beings die out. The future generations of these beings morph over time based on adaptations they have experienced. Therefore, Darwin taught all living things have a common ancestry. The teaching of evolution was controversialto Fundamentalists. Fundamentalist Christianity is a conservative form of Christianity that maintains a rigid interpretation of the Bible. Fundamentalists believe the God of Christianity created all things, the Bible was inspired by God, and the creation narrative in the Bible is to be interrupted rigidly as seven literal days of creation. Many citizens of the USA, especially in the South, practiced Fundamentalist Christianity in the 1920s and many also rejected the teaching of evolution as irreconcilable with their interpretation of the Bible. Many secularists believedliving things evolved overtime and originated from non-living things, a process called abiogenesis. Numerous secularists were atheists, agnostics, and deists who believed that the Bible was a collection of writings and myths, not God’s word. While fundamentalists believed Darwinism went against their faith, other followers of Christianity, such as Modernists, felt Darwinism was compatible with Christianity. In March of 1925, Tennessee banned the teaching of evolution. John T. Scopes, a teacher, went against the law and taught the topic in a biology class. He had to appear in court for violating the law. His case was dubbed, “The Scopes Monkey Trial.” Two lawyers faced off in the case. Clarence Darrow defended Scopes against William Jennings Bryan, a Fundamentalist. The issue at hand was whether or not evolution should be taught at public schools. Scopes lost and was fined $100.00 for teaching evolution.